With spring finally here and the snow hopefully melted where you are, it’s time again for running/outdoor exercise season. You need snacks that are portable, tasty, and provide some serious fuel – which means energy bars for most people. Those are healthy, right? Not always, it turns out. Many packaged energy bars are loaded with refined sugars and the preservatives necessary to keep them on the shelves. 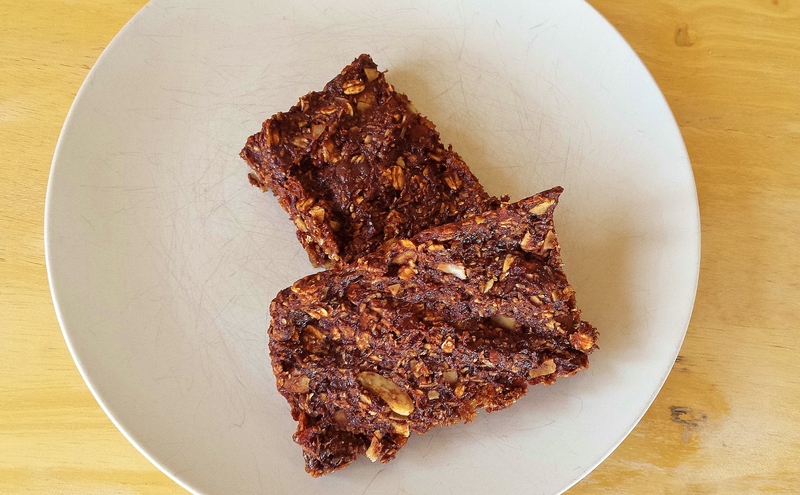 But it really isn’t hard to make your own natural snack bars. These chocolate coconut chia bars are a snap to make and contain only natural ingredients and no refined sugars. With the wonderful antioxidant properties of the chia seeds and raw cacao, the omega-3 fatty acids in the flaxseeds, the protein in the almonds, the potassium in the banana, the natural sugars in the dates, shredded coconut, maple syrup and honey . . . I could go on and on and on! Needless to say, you can feel great about eating several of these babies post-workout. And not only are they good for you, they are pretty tasty, too! Preheat oven to 350 degrees. Grease a 9x9-inch baking dish (I used coconut oil for this). If dates are overly dried out (when dates are fresh, they are nice and sticky), soak them fully submerged in a bowl of hot water for 15 minutes. Once ready, combine them with 1/4 cup of water in a food processor and blend until they are a relatively smooth consistency. Mix in a large mixing bowl with mashed banana. Grind flaxseeds in a coffee or spice grinder until they are reduced to a fine powder. Add that to the banana-date mixture along with the crushed sliced almonds, oats, chia seeds, coconut flakes, raw cacao, maple syrup, honey, melted coconut oil, and sea salt. Mix well, then spread evenly to cover the bottom of the 9x9-inch baking dish. Press mixture down well in the pan so it's smooth and uniform-looking. Bake on middle-oven rack for 20 minutes, then remove and let cool before cutting into bars of desired size. Then grab one or two, lace up those running shoes, and head out!